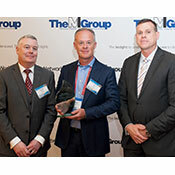 Kent recognised as top relocation service provider by TheMIGroup. L to R: Dwayne Waldrop (TheMIGroup), Tim Irwin (Kent), and Damian Dooley (TheMIGroup). 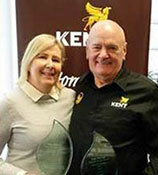 Kent Relocation Services is pleased to announce that we have received TheMIGroup’s 2015 ‘Spirit of Partnership’ Award at their recent Worldwide Partner Network® Awards. In addition, Lisa Fink, Kent’s National Client Services Manager, has also won the ‘Individual Excellence in Partnership’ Award. TheMIGroup Worldwide Partner Network® Awards are based on a set of evaluation criteria designed to quantify their partners’ quality service performance. The Awards have quickly become a benchmark for excellence in the global relocation industry, recognising the achievements and outstanding service delivery of TheMIGroup’s network providers over the previous 12 months. According to TheMIGroup, this year’s winners excelled in all areas evaluated, and consistently demonstrated high quality service and the desire to exceed expectations. In receiving TheMIGroup Worldwide Partner Network® Award, Kent Relocation Services reinforces its commitment and dedication to delivering high-quality corporate relocation solutions, not only to TheMIGroup’s clients, but also to our own clients and their employees. Founded in 1978, TheMIGroup is a leading provider of global relocation management solutions, from total assignment management to individual services for transferees, expatriates or individuals on the move. With full service business units strategically located throughout The Americas, Europe and Asia, TheMIGroup Worldwide Partner Network® is located in over 150 countries.